Well, we didn’t have a peach tree. One of our backyards was lined with long-needled pines, another sloped down to a mass of untended brush and old deciduous trees. But we’ve always told her she’s our Georgia peach so what else is she to think? Our son was born here, in Washington State. So naturally, he’s our little apple. And if you met him, or watched him eat, you’d know this kid is living up to his birthright. He eats apples every day of the year. We have to have a moratorium on apples sometimes, which doesn’t make sense to him. 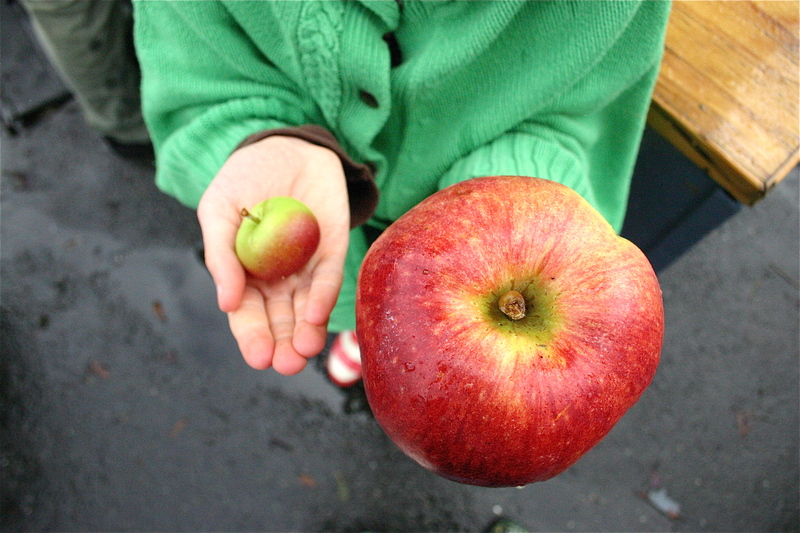 Lucky for him, it’s the season for the quintessential Washington fruit. It’s hard to get enough – I even feel that right now. I always forget how much better they taste when they’re in season. During the rest of the year, we slowly acclimate to the taste of apples that have been in cold storage for months on end. Last week at the market I counted a dozen or more varieties, skins ranging in color from candlewax yellow to candy-striped red, and it seems they are sized to order. I actually had a hard time deciding what to make this week. It’s strange. The bigger the oyster, the harder it is to fry it, I guess. Same with apples. So many possibilities. I narrowed it down to one apple and beet salad that’s a reflection of the cold air outside: brilliant and chilly. A perfect way to enjoy two seasonal goodies. But since I found it in a cookbook with paper pages, I don’t have permission to share it with you. Not yet. I’m working on it. When I realized my plans were derailed, I eddied; thinking about that salad. And that, dear Plum Palate Facebook fans, is why I didn’t get a shopping list out to you this week. I’m sorry. 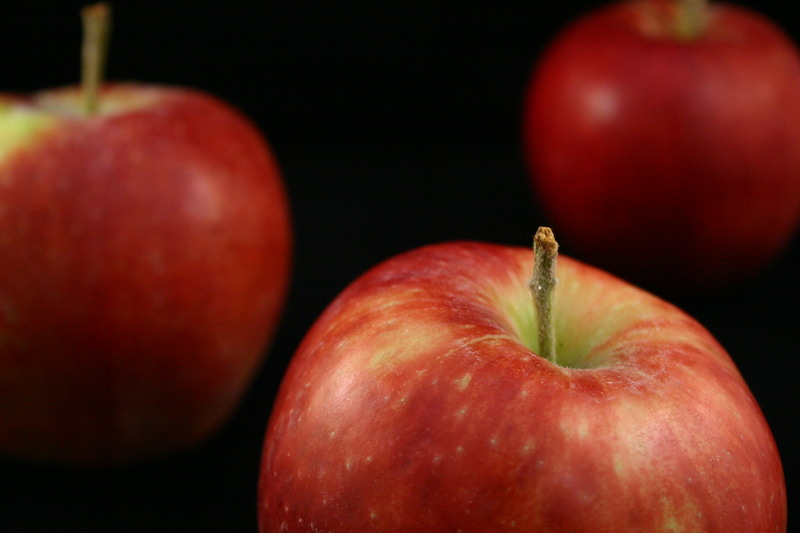 The truth is, I finally settled on a worthy apple recipe today. 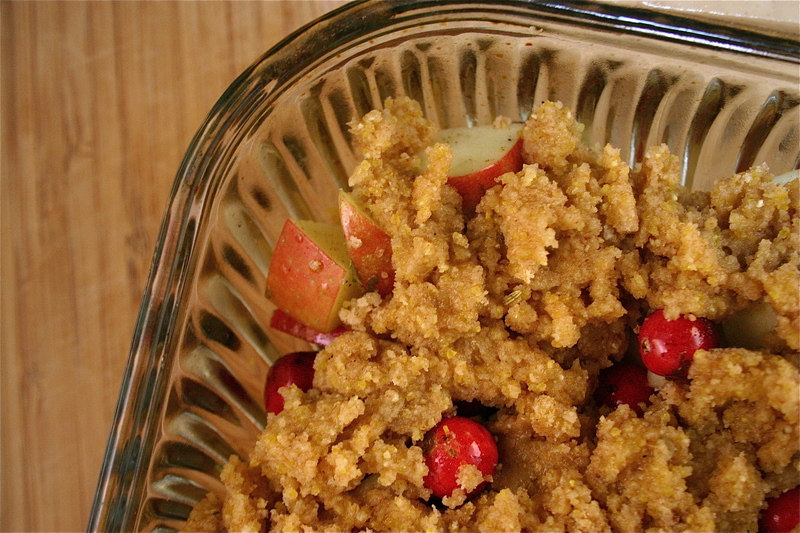 The polenta in this streusel topping is what drew me in to the recipe I’m sharing with you this week. I love hearty food and the combination of polenta and two seasonal fruits sent me off to the cabinet to pull out my food processor. Now, I’m not a fan of cobbler; the cobbles on top are often too dry and cakey for me. The “crisp” in the title of this recipe sounded lighter, making me think of a crumble – sweet, soft fruit with a light oats-and-nuts combo on top for texture. But despite what the title may declare, this is a cobbler. The recipe makes enough streusel topping to cover the pan from edge to edge and it’s substantial. Perfect for blopping on top to make it look like the cobbled streets the dessert is named for. But ending up with a cobbler wasn’t the biggest problem: the polenta didn’t soften enough to make it work in a topping like this one. Or, I suspect, I didn’t add extra liquid to compensate for my substitution of whole grain flours. Dang. 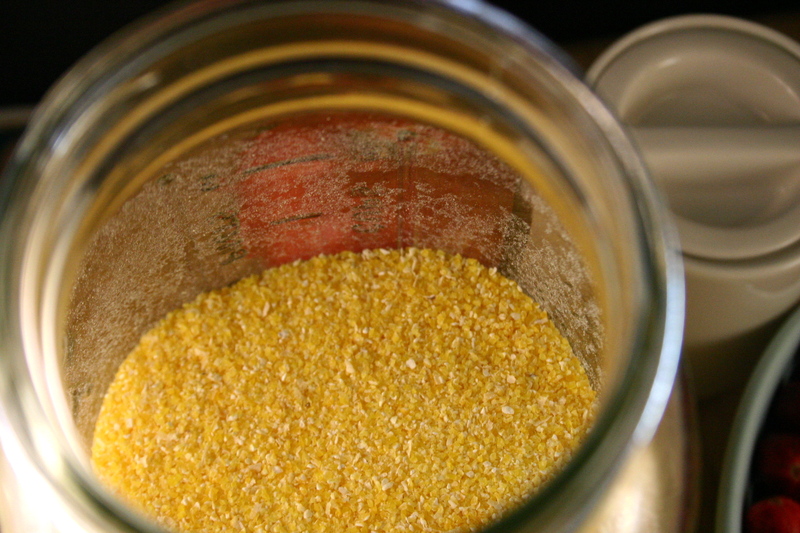 If I make it again I’ll up the liquids and try a finer cornmeal or depart from corn altogether. And it’s not quite fair to criticize anyway; I substituted heavily to try and achieve something along the lines of healthy and to accommodate the diminishing reserves in our kitchen. The chef at Smitten Kitchen, where I found this recipe, used the recommended amount of sugar and had to throw it away, it was so sweet! I took my cue and added just a cup of honey in total, half a cup in the topping and the other in the filling. 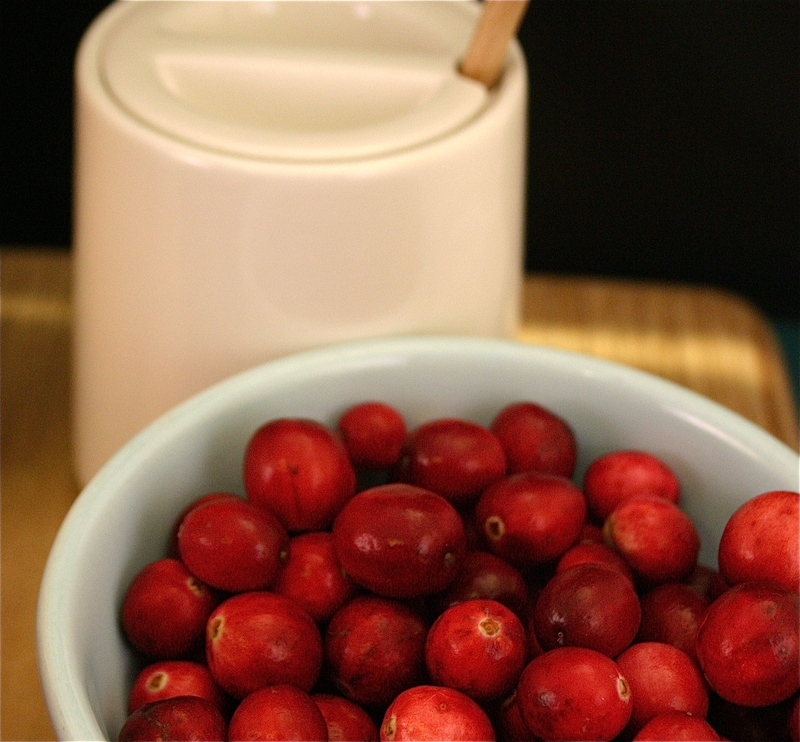 It doesn’t need any more than that, even with the tart cranberries (the original recipe calls for half a cup of white sugar in the topping plus a whopping cup and a third of refined sugars in the filling – egads!). I didn’t have either of the citruses that evoke Christmas baking (mmm…those lemon cookies and orange glazes!) so I used some of the limes left over from last week’s chutney for both zest and juice. Instead of pastry flour I used a combination of whole wheat and brown rice flour. 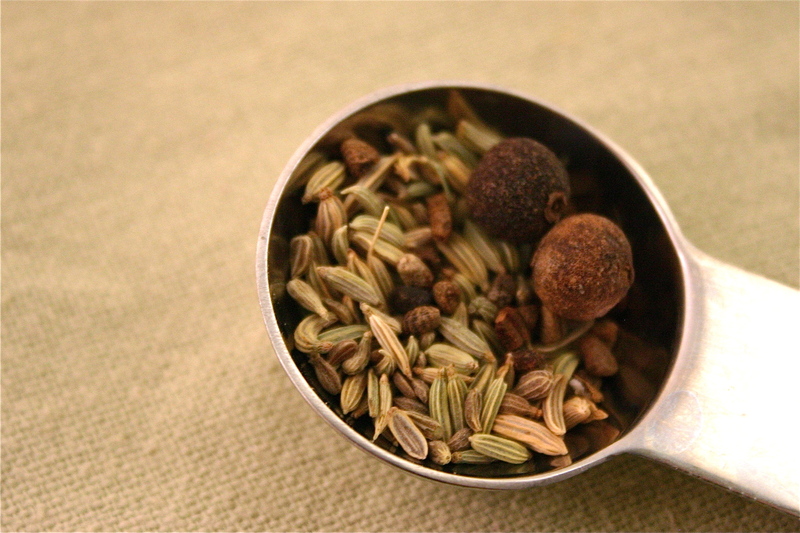 The biggest risk was to ditch the anise, a spice I have yet to make friends with. My spice substitutions wouldn’t have worked if it hadn’t been for a bit of ice cream to top it off. I had a tablespoon or so on top of my helping today and is it ever good with the cardamom I included. Or maybe I was reveling in the tiniest bit of dairy; over the past several weeks I’ve been vegan-izing my diet. Which reminds me, I used Earth Balance instead of butter. (I know, baking purists, don’t even say it.) If I could do the spices over, I’d toast the seeds (I used fennel, two allspice berries, and just a few whole cardamom seeds) then grind them all up finely in a spice mill. Today, I did this with the allspice only – I had to fish out the whole berries from the flour mixture when I saw them pinging around the inside of the processor bowl. But overall? It’s homey and very good. The lime brightens the apple and cranberry flavors. The faux butter vegansubstitute was perfect to bake with. 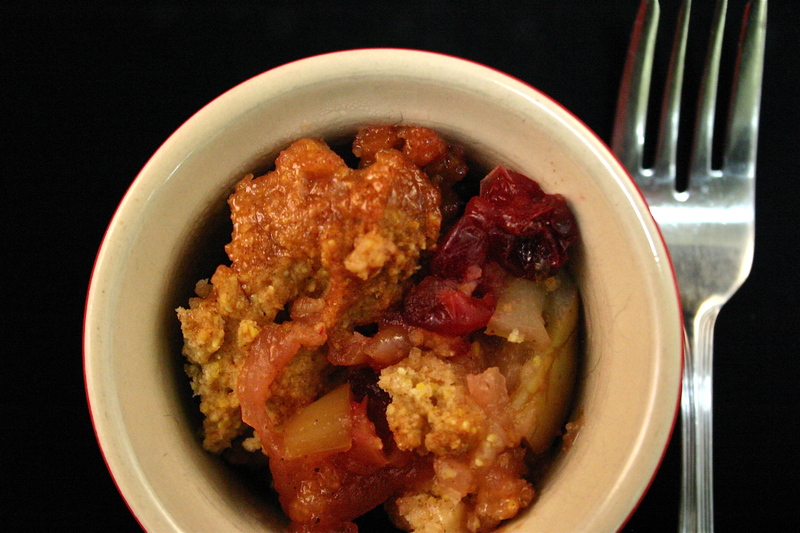 The topping would have baked up nicely with more liquid, perhaps, but the spices complemented the apple. My daughter thought there was too much topping and not enough fruit. My husband wanted more of a classic take, rich with brown sugar. My son, now four, made me turn my head when he took his first bite and asked, “Does this have fennel in it?” Why, yes. It does. Maybe he’s destined to branch out from plain sliced apples someday. Adapted from Smitten Kitchen and Michael Chiarello. about 3 minutes. Grind seeds with mortar and pestle or in a spice grinder. Add to food processor bowl then add next 5 ingredients. Blend a few seconds. 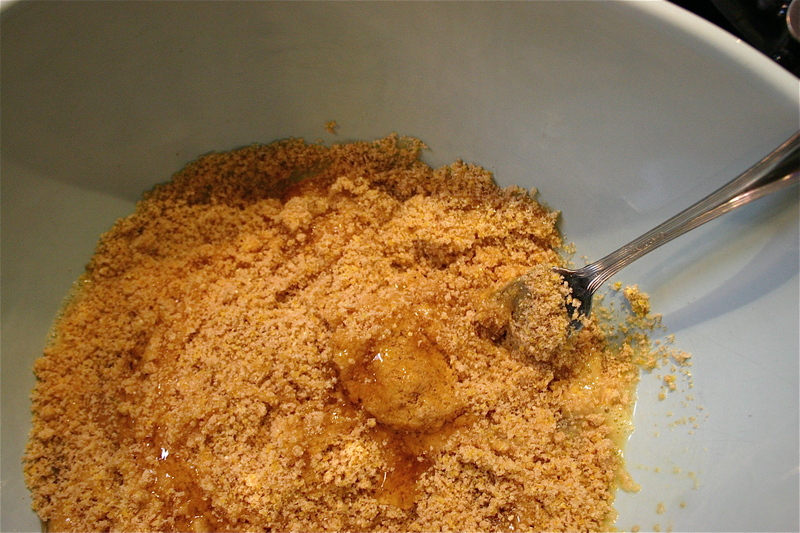 Add butter and blend, using on/off turns, until mixture resembles coarse crumbs. 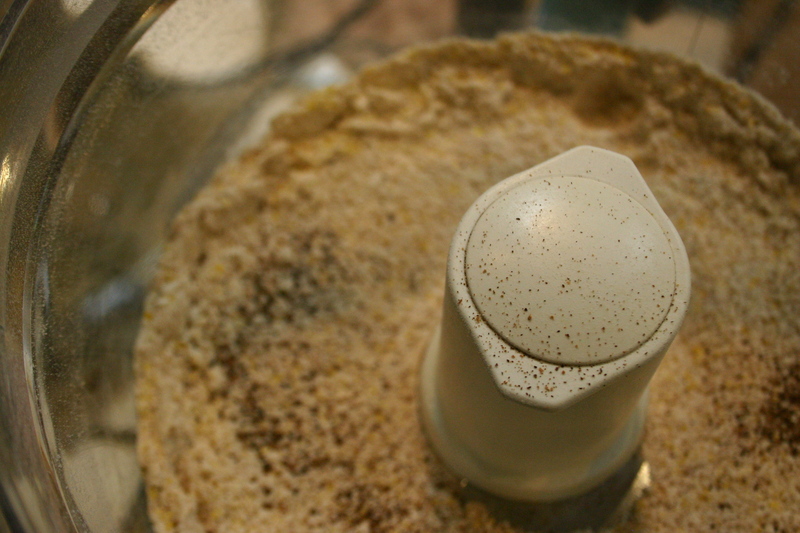 Transfer mixture to large bowl. Drizzle egg and honey over the top and stir until ingredients are evenly moistened. Filling: Preheat oven to 375°F. Combine first 5 ingredients in a large bowl and stir to blend. Add apples, lemon juice and honey. Toss to blend. 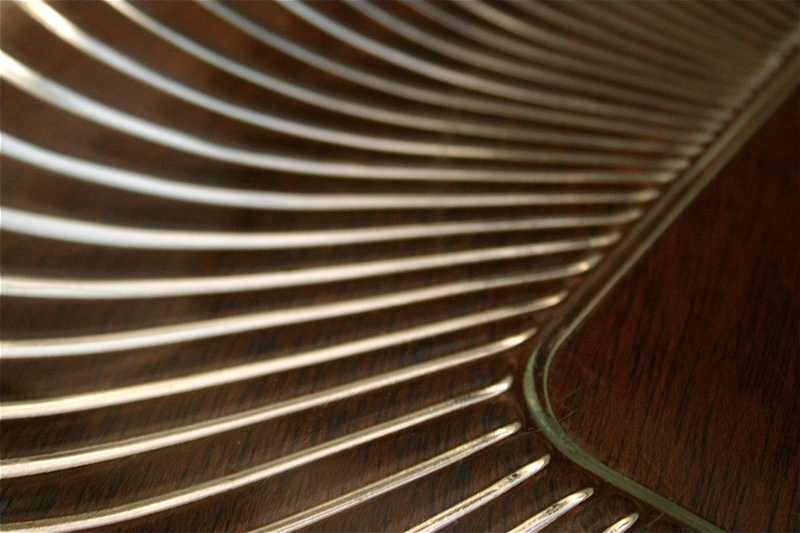 Transfer filling to a rectangular glass baking dish like this beauty I’ve had since the mid-90’s. 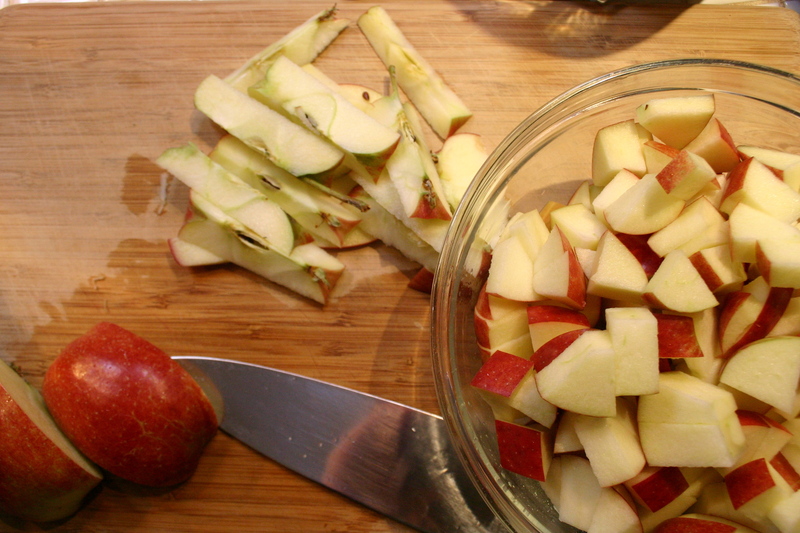 Bake dessert until apples are tender, juices bubble, and topping is crisp and golden, about 1 hour. Cool 15 minutes. Serve warm with vanilla ice cream or gelato. 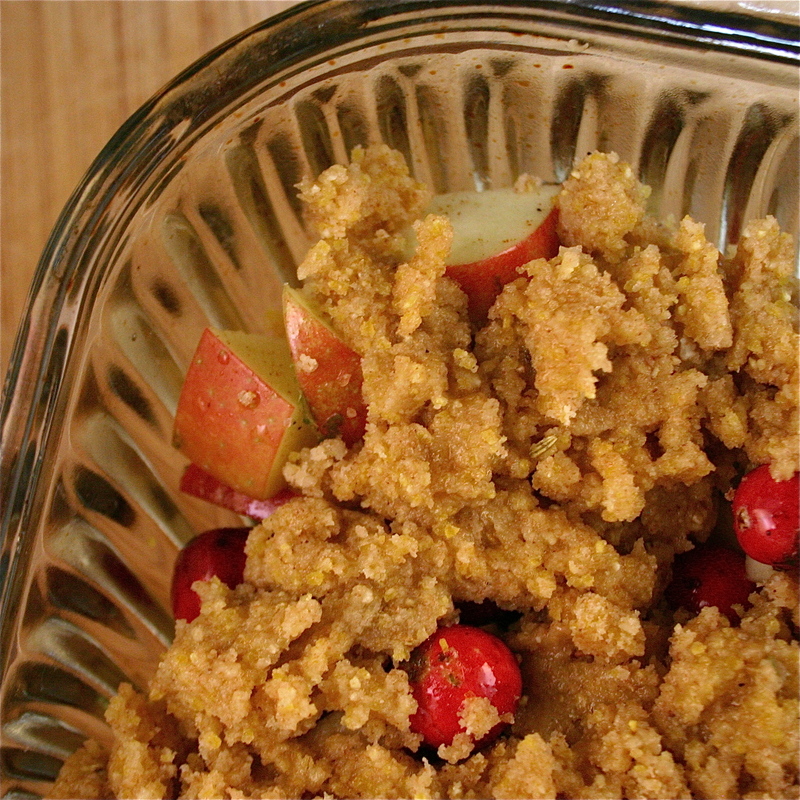 This entry was posted in Fall Fruits, Recipes and tagged Apple, Butter, Cranberry, Egg, Honey, Local, Organic, Salt. Bookmark the permalink. YUM!!!!! I can’t wait to make this one… my sub for pumpkin pie for Thanksgiving! and I didn’t know how cobbler got its name til now…Thanks!